Wow, this month has flown by and this post is my first "Monthly Catch Up". I have been trying to post more regularly, I normally post once - twice a week but now I have tried to post every two days. Let me know if you enjoy these more regular and frequent post because if you do I'll try and keep to this schedule. If you a missed any posts, here is the place to find all of them for the month of October. 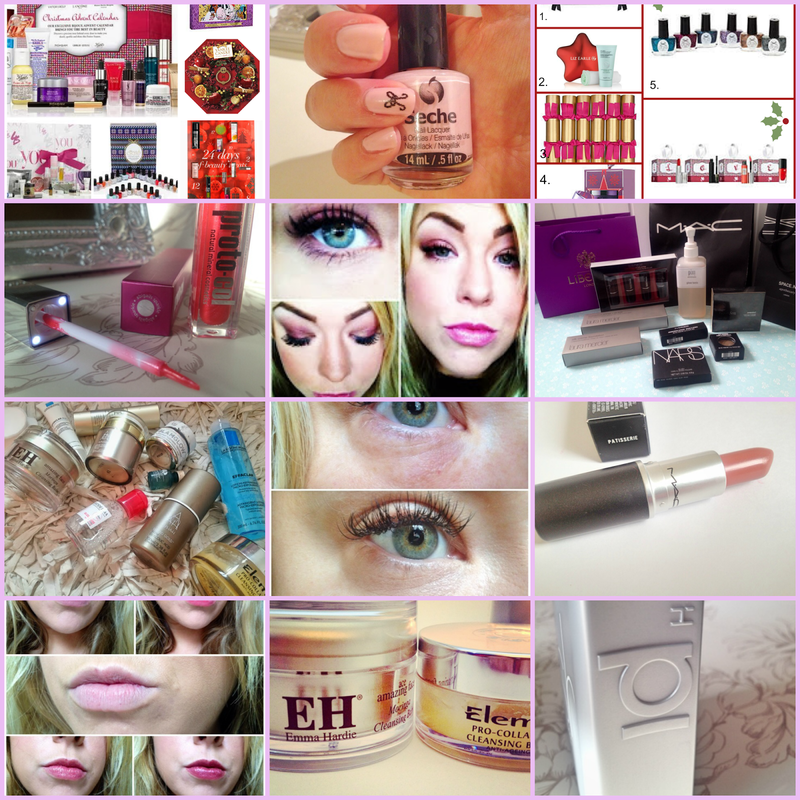 Its quite a missed bag this month, with Christmas just around the corner there have been some festive posts thrown in there to get you in the mood as well as a Haul, FOTD's, Reviews, Tags and loads more! A run down of all the Beauty Advent Calendars available this year. If you love Christmas and trying out new beauty products this is a good place to start. NOTD using Nail Decals . If you love nail art and struggle with it, this post reviews nail tattoos, they are super easy to do. Another Christmas post and this one is all about Crackers and Baubles filled with Beauty treats. I love these and think they're such a novel and great idea. I certainly have my eye on a few of them. Proto-col Lipgloss. A great lip product that is has a L.E.D light and mirror encased, perfect for nights out and a handbag essential. FOTD - All About Purple. I am not one for experimenting with colours when it comes to eye make up and tend to play it save by using browns and golds, but in this post I step out of my comfort zone and try out purple! London Beauty Haul. I may have gone a bit mad and purchased some unnecessary items on my trip to London, If you like haul posts this one is a good'un! Skin Care Tag. Find out the answers to this tag and do the tag yourself! Bobbi Brown Corrector - banish those dark under eye circles. A disappointing review of Mac Patisserie . Find out what I didn't like about this lipstick and why. Review from one of the Christmas collections from Laura Mercier, Luxe StickGloss Collection. Find out which Cleansing balm I think is better, Elemis Cleansing Balm or Emma Hardie Cleansing Balm? Find out why Blonde hair turns brassy and ways to combat it with IdHAIR Silver Shampoo. I hope you have enjoyed this months posts and look forward to sharing new ones with you next month!